Jeremy Bally, (26), is a Canadian activist campaigning on human rights issues in West Papua. 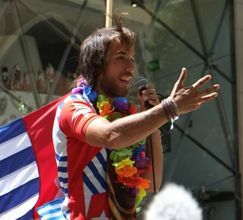 He has recently finished his Pedalling for Papua campaign in which he rode his bicycle through seven different countries in the last six months, to spread the words about the ongoing human rights abuses in West Papua. 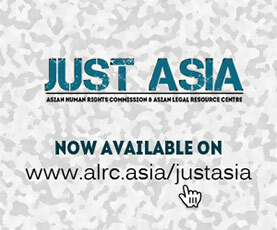 He spoke to the Asian Human Rights Commission (AHRC) on his campaign and experience of being misrepresented by the Indonesian media. Can you tell us about the campaign? What is it actually about and where did you get the idea? The idea came up almost four years ago now after I learned about West Papua from a friend in Canada. I just got into biking anyway and what I learned about seemed like a story that really needed to be told, seemed to be an intriguing story to tell. Last year I rolled across Canada and after that one I thought it will be worthwhile to do it again. So this past six months, almost seven months, since I left actually, I’ve ridden my bicycle through seven countries and covered about 12,000 kilometres, and done around 70 awareness-raising events about West Papua. How did the people you met during the tour and the people who attended your presentations take the message you’re trying to convey? It was 99% positive. I had a few presentations in the Netherlands and New Zealand where some Indonesian students, who I think were coming with a mandate from the Embassy while they are on scholarships from the government, to come to Papuan events and speak negatively about it. But other than those, very, very few cases, people were really intrigued to learn about something they have had not known before because for the most part there were people that had never heard of West Papua. I tried to deliver the message in sort of artistic, engaging, theatrical way because I think it’s just sort of more memorable for people to hear it like that. And yes, there was really, really positive reception throughout. How did the Indonesian students take your presentation? I’m not really sure exactly what the mandate these students had from the embassy. The presentation I did in The Hague, in the Netherlands, is a pretty good example. Basically, the guy afterwards asked a question by way of making a very long statement about how things in West Papua are fine and the claims of human rights abuses are very exaggerated, not the kind of things which you’d be very familiar with. And afterwards I was talking to some of the people who were helping me to organise the event and they said that it was pretty much word for word what other Indonesians students have said when they came out to these things. So I think the students are coming, perhaps, with like a strong belief that what they say is accurate, but they all have a really, really specific mandate from the embassy to talk about it in those kind of ways. 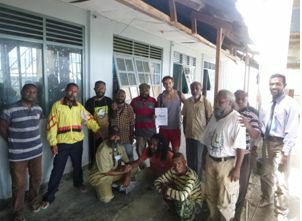 You recently met with the Papua political prisoners in Abepura prison. How is the condition of the political prisoners there? The day that I saw them, they were all in very good spirits. I was really happy to meet them. So there was an air of it being good the day that I was there. But that is absolutely not the case in general for the prisoners there. A lot of these guys have been subjected to torture when they were arrested, they are isolated regularly. Sort of the bottom line is they are in prison for raising the flag, speaking at a rally, speaking up peacefully, doing things that according to the Universal Declaration of Human Rights which Indonesia is a signatory to is just not acceptable. Their criminal code is completely contrary to their international obligation. These prisoners are victims of this discrepancy. To say that their conditions are OK is kind of crazy. They were again in good spirits on that day but I think it’s because they were receiving this message of solidarity I was bringing in, and getting a sense of the international recognition of what they are going through. But in some media in Indonesia – the Jakarta Post, the Jakarta Globe and Okezone – wrote that you’ve said the political prisoners are “healthy and have no problems. I’m sure that officers in the prison have treated them well”? They also reported that you’ve said “it turned out that Papua is not like what I have heard”. Have they misquoted you? It was not even a misquote, it was just a lie. It was just putting words in my mouth completely. It was frustrating. It was actually infuriating to be subjected into that kind of propaganda. This campaign, so many people working hard to make it actually happens and I’ve been used for Indonesian propaganda so it was infuriating. Did you complain to these media? I complained to the Jakarta Globe and I have been cleared up. So they replaced their article with another one which is good and I’m totally happy with. As with the Jakarta Post, I came to their office and spoke with the Editor for the Archipelago division, which I guess covers Papua stuff. And told him what my issues are with the article. He basically chalked it up to mistranslation or something that has been lost in translation, which could not be possibly the case because I never said anything that even close to that. So I’m quite convinced that it’s a politically motivated article. I’ve written a letter to the Editor and sent that to him. I also commented on the bottom part of the article on the website. I’ve got a member of my team who supports us internationally who also wrote to the editor. Just to make sure it’s well known that it’s insulting to me, to the campaign, to the cause, for the prisoners to be misrepresented and to be used for propaganda like that. Has there been any response from the Editor of Jakarta Post at all? No, not yet. I’m going to call him again later tonight and tomorrow to follow up if I don’t hear from him. I’m going to keep on that one. But if that one does not change, I’m going to be writing an article when I get back home just to sum it up for the Canadian and international media. I’ll use it as an example how the Indonesian media can be used to betray Papua in a negative or misleading light, which is how a lot of Indonesians are given the wrong impression about what is going on in Papua. Who were the journalists present during your visit to Abepura prison? Do you remember from what newspaper or media are they? I can’t remember his name but there was one with the Associated Free Press, and their article is actually quite good. I can’t remember all the names but I do have some of their business cards. But I haven’t seen their contents come out yet. So whoever it was from the Jakarta Post – I don’t remember anyone there from the Jakarta Post – either they got their files from someone else or they lied about where they were coming from. What is the human rights situation like in Papua these days, in your observation? I have met unofficially with the human rights activists in Papua as they were helping me to organise the meeting with the political prisoners. I cannot tell you who have helped me to organise it as the situation in Papua is so volatile so for people on the ground to have their names exposed. It exposes them to the risk of becoming political prisoners themselves. One of the guys I met, Victor Yeimo, who is the General Secretary of the West Papua National Committee, he was arrested this year for political reason, because he is heading this Commission which held a lot of demonstration asking for referendum for Papua. Few months ago, the report of his arrest said that he and his party were beaten with rattan canes and kicked when they were arrested and his sentence is three times longer than what was actually handed down to him. So these are just examples of what have been going on. On December 1st there was a rally in Jayapura that was apparently not approved by the military or security forces. To break it up, the security forces fired live rounds at the crowd, a lot of people were injured, and one person was reported dead. So it’s kind of the same as it been, it’s just not getting better. But I think the movement within Papua and outside Papua is not cooling down the Indonesian strategy about cooling this thing down is not working at all, I don’t know why they are not really catching onto the fact that violence is not going to work for either side. I feel the situation is the way it has been in the last ten years and before that. They need to start looking into different solutions. Now that you have spread the word about human rights issues in West Papua in seven countries, you also have met with the political prisoners. What is next? I’m going back to Canada and take a rest for a while because I haven’t had rest for a while. I’m quite keen to go to law school and sort of to expand my own capacity to be able to support the West Papua cause. I’ve been an activist for a long time but it has been in my personal capacity. I want to do it in my professional capacity in order to be able to support the cause. What do the young people around the world like you can do to help to improve the human rights situation in Papua better?